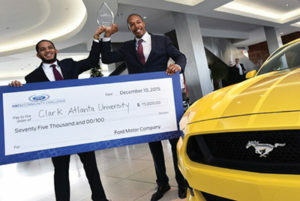 DETROIT, MICH (BlackNews.com) — Ford Motor Company Fund, the philanthropic arm of Ford Motor Company, is offering an opportunity for college students, alumni, faculty, and administrators at Historically Black Colleges and Universities (HBCUs) to submit an innovative proposal that addresses a mobility need on campus or in their community. The HBC-You Mobility Challenge is officially open and details regarding the program can be found at http://fgb.life. The last day to submit proposals is March 31, 2019 and winners will be announced in May 2019. The program launch is part of Ford Fund’s Black History Month Ford Goes Further in OUR Community campaign. The Ford HBC-You Mobility Challenge is a special initiative of Ford Motor Company Fund – the philanthropic arm of Ford Motor Company. Its purpose is to challenge students, alumni, faculty and administrators to design innovative mobility-based projects that address critical campus or community needs consistent with charitable purposes. With the theme of “Making Lives Better: Changing the Way We Move Through Smart Mobility,” the challenge was created to empower HBCU students, alumni, faculty and administrators to collaborate on creating and implementing sustainable solutions that address unmet needs and improve the lives of individuals within their communities. Ford Motor Company Fund understands the role it plays in providing access to services that address basic needs, economic growth and help improve quality of life. The HBC-You Mobility Challenge is the latest in the Ford Fund’s decades-long commitment to supporting historically Black colleges and universities and students that attend them.